Manolo is a popular local staple in Buenos Aires. It is also one of the cheapest (though not quite as cheap as your outdated paper guide books say – inflation is on the rise in Buenos Aires), and a place where you are assured of getting a true ‘Buenos Aires’ experience. Located just blocks away from Parque Lezama in San Telmo, the place where some people believe Buenos Aires was first founded by Pedro de Mendoza, Manolo (the name of the original owner, as well as the restaurant) has served up massive portions of meat (bife de chorizo/rump steak, lomo/tenderloin steak, asado/ribs…etc), pasta and fish dishes for so long that many locals assume he was part of that initial founding party back in 1536. Although Manolo himself has sadly since passed away, the tradition is carried on by his family, who now tend to the restaurant and ensure that the age-old custom of serving a good, hearty meal lives on. If you are going for meat, try one of the ‘regional’ takes on the usual parrilla suspects, that will at least provide some variety from the other parrillas you visit when in Buenos Aires – these include a Guadalajara-style Lomo, a Canadian Bife de Chorizo and Cerdo (Pork) a la Nebraska, all of which taste as interesting as they sound, and prove that even an old dog like Manolo can show off a few innovative tricks. If you’ve had enough beef, the pasta dishes do not disappoint. Be prepared for MOUNTAINOUS portions, which could easily fill two people each. They offer Noquis (Gnocchis) a la Piemontesa (a chicken, olive, tomato & basil sauce) as well as Spaghetti a la Muzzarella (a ham, mushroom, muzzarella, scallion & cream sauce), just to name a few. Although all variations are tasty, the portions abound, so make sure you really starve yourself before visiting Manolo. As for the restaurant itself, it isn’t all that in terms of decor – very plain and simple. BUT, this is compensated for by the reams for football (soccer) shirts, flags and memorabilia plastered over every inch of wallspace. And, the atmosphere is not far removed from a loud, passionate football crowd either – almost always full of Argentine regulars (and a fair few tourists), lunch and dinner, the patrons certainly work up a fair old noise, helped along by the cheap house red wine. One final thing to note – due to the popularity of the restaurant there may be a long wait for a table on weekend nights, but that is all part of the experience, as they say. And if a slightly raucous atmosphere does not sound like a nice dining environment to you, visit at lunchtime when things are more laid back. 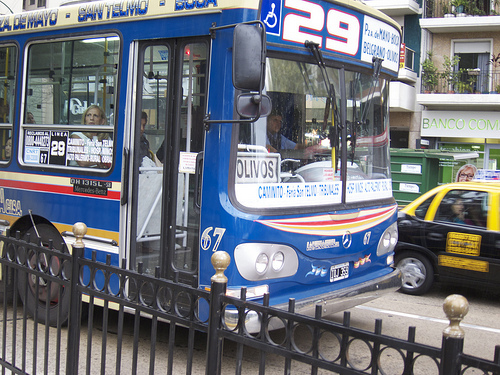 Always a good one if you are looking for factual information about the city, is Wikipedia Buenos Aires. The great thing about Wikipedia of course, is that if you don’t agree with something, or see an area missing that you know all about, then you can edit it yourself for the good of everyone. And don’t just stop after looking at the Buenos Aires page – there are many other interesting Wiki pages related to Buenos Aires, including the extremely thorough Argentina page, pieces on barrios such as Recoleta and Palermo, and this great article on Admiral William (Guillermo) Brown, the Irish-born seadog that effectively founded the Argentine navy! If you really want to help out, you can also sign up to the Wikiproject Argentina page and start contributing to items on the ‘things to do’ list. The Buenos Aires Government Tourism website weighs in with some very useful info and rescources too. They have some really good self guided tours, in text and audio formats, and lists of events etc that are going on in the city. This guy has a nice page on nightlife in Buenos Aires. I would recommend checking it out when planning that night on the tiles in BA. And when we say night on the tiles here in Buenos Aires, we mean the whole night! Most Argentines actually only go out to clubs the same time that they would be closing back in my land of birth, the UK. Of course, forums are a good place to ask difficult questions about Buenos Aires, and be assured of a rapid response from people that are in the know. The most active Buenos Aires forum is probably the one over at Tripadvisor. Bloggers from BA also know A LOT about the the city. They probably wouldn’t have started a blog about their life in the city otherwise. 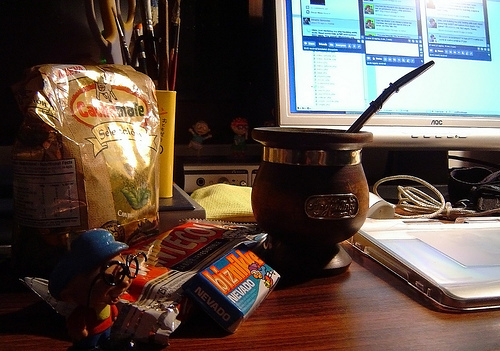 Bloggers in Argentina has an almost comprehensive list of Buenos Aires and Argentina blogs for you to wade through. And don’t forget to ask us bloggers questions – we don’t bite! Last, and certainly not least, there are the all important maps. Vital to finding your way around the city. But i’m not just talking about any old kind of maps here…I’m talking INTERACTIVE MAPS OF BUENOS AIRES! Dalton, over at “Oh! Buenos Aires”, has used his technological knowhow to produce some great ‘mash-ups’ (as we internet geeks call them) of maps for Buenos Aires, using Google Earth Maps and MSN Live Local Maps. Thus he has created a virtual tour of the sights of Buenos Aires, and something similar in more traditional map format. Check them out! The Four Seasons is equidistant between the heart of Recoleta and the Microcentro, and so it is within walking distance of many major attractions (i.e. Recoleta Cemetery, Teatro Colon, The Obelisk, Avenida Alvear, Florida Street, Puerto Madero, Plaza San Martin). Obviously it is also perfectly placed for a very short and cheap taxi trip to any of these places. The Four Seasons is found close to the end of busy Avenida 9 de Julio, but at that point the noise is not as noticeable. In fact quite the opposite – it is a peaceful, nice area to stay in, where you wouldn’t realize how close to the center you actually are. Add to the mix the fact that some of the best (high-end) shopping and restaurants are in this area, and you have one of the best hotel locations in Buenos Aires. As you would expect in this price range, the rooms are very large, of course very clean & well turned out, tastefully decorated and perfectly furnished, but nothing over the top in extravagance. The bathrooms are also lush, with nice features like high quality bathrobes, luxurious towels and lovely fluffy slippers. Also the shower and bath are oversized with marble everywhere, the shower being especially nice after a long day’s sightseeing, as it has a huge showerhead with an amazing rate of water flow & pressure. 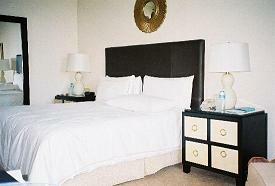 The beds are superb, with a down comforter. Very impressive. Also for the price, you would expect the staff to keep you well looked after. And they go beyond that, especially the attentive and knowledgeable concierge desk. Make the most of them – ask them to organize, among other things, restaurant reservations for you – you will also get much better service at the restaurants by doing so, due to the power of the Four Seasons name in Buenos Aires! Most that stay in the Four Seasons say the main factor that sets it apart from other hotels in this upper price range is their outstanding service. Nice to know they are working hard for your money! Extensive personal attention is given to every guest, and you will often be referred to by name by staff you have never seen before. They are on the whole genuinely kind without being over the top or intrusive. Nice extras like fresh fruit every day are a bonus. And, if anything does go wrong, they will fix it in a flash and usually provide something complimentary for your trouble. Attractive outdoor pool to the rear of the hotel. Seven suite turn-of-the-20th-century chateau with 24 hour butler service, where rock stars like U2 and the Rolling Stones stay (complete with crazy fans camping outside day and night) when they are in town. However, it comes at a huge cost. If it’s a little out of your budget, you can still appreciate the amazing architecture inside the mansion by taking Sunday brunch there. Gorgeous gym and impressive spa. Business center to check email etc, free use, with complimentary drinks. Cellular phone for local use. 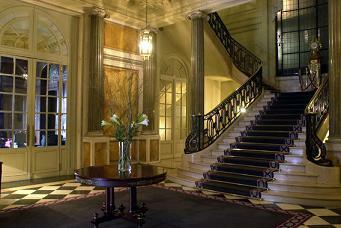 The hotel restaurant is called Le Mistral, and is a quality, opulent establishment. 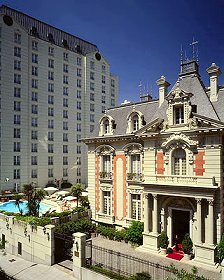 For another Four Seasons tip, check out this post on five 5 Star Hotels in Buenos Aires, and how to enjoy them on a budget.